Monocytes are amoeboid in appearance, and have a granulated cytoplasm. 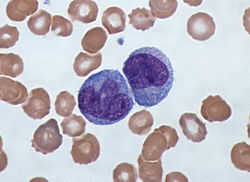 Containing unilobar nuclei, these cells are one of the types of mononuclear leukocytes which shelter azurophil granules. The archetypal geometry of the monocyte nucleus is ellipsoidal; metaphorically bean-shaped or kidney-shaped, although the most significant distinction is that the nuclear envelope should not be hyperbolically furcated into lobes. Contrast to this classification occurs in polymorphonuclear leukocytes. Monocytes compose 2% to 10% of all leukocytes in the human body and serve multiple roles in immune function. Such roles include: replenishing resident macrophages under normal conditions; migration within approximately 8–12 hours in response to inflammation signals from sites of infection in the tissues; and differentiation into macrophages or dendritic cells to effect an immune response. In an adult human, half of the monocytes are stored in the spleen. These change into macrophages after entering into appropriate tissue spaces, and can transform into foam cells in endothelium. The non-classical monocyte shows low level expression of CD14 and additional co-expression of the CD16 receptor (CD14+CD16++ monocyte). The intermediate monocyte with high level expression of CD14 and low level expression of CD16 (CD14++CD16+ monocytes). While in humans the level of CD14 expression can be used to differentiate non-classical and intermediate monocytes, the slan cell surface marker was shown to give an unequivocal separation of the two cell types. Ghattas et al. state that the "intermediate" monocyte population is likely to be a unique subpopulation of monocytes, as opposed to a developmental step, due to their comparatively high expression of surface receptors involved in reparative processes(including vascular endothelial growth factors type 1 and 2, CXCR4, and Tie-2) as well as evidence that the "intermediate" subset is specifically enriched in the bone marrow. After stimulation with microbial products the CD14+CD16++ monocytes produce high amounts of pro-inflammatory cytokines like tumor necrosis factor and interleukin-12. Said et al. showed that activated monocytes express high levels of PD-1 which might explain the higher expression of PD-1 in CD14+CD16++ monocytes as compared to CD14++CD16- monocytes. Triggering monocytes-expressed PD-1 by its ligand PD-L1 induces IL-10 production which activates CD4 Th2 cells and inhibits CD4 Th1 cell function. In mice, monocytes can be divided in two subpopulations. Inflammatory monocytes (Cx3CR1low, CCR2+, Ly6Chigh), which are equivalent to human classical CD14++ CD16− monocytes and resident monocytes (Cx3CR1high, CCR2neg, Ly6Clow), which are equivalent to human non-classical CD14low CD16+ monocytes. Resident monocytes have the ability to patrol along the endothelium wall in the steady state and under inflammatory conditions. In man a monocyte crawling behavior, similar to the patrolling in mice, has been demonstrated both for the classical and the non-classical monocytes. Monocytes are produced by the bone marrow from precursors called monoblasts, bipotent cells that differentiated from hematopoietic stem cells. Monocytes circulate in the bloodstream for about one to three days and then typically move into tissues throughout the body where they differentiate into macrophages and dendritic cells. They constitute between three and eight percent of the leukocytes in the blood. About half of the body's monocytes are stored as a reserve in the spleen in clusters in the red pulp's Cords of Billroth. Moreover, monocytes are the largest corpuscle in blood. Monocytes which migrate from the bloodstream to other tissues will then differentiate into tissue resident macrophages or dendritic cells. Macrophages are responsible for protecting tissues from foreign substances, but are also suspected to be important in the formation of important organs like the heart and brain. They are cells that possess a large smooth nucleus, a large area of cytoplasm, and many internal vesicles for processing foreign material. In vitro, monocytes can differentiate into dendritic cells by adding the cytokines granulocyte macrophage colony-stimulating factor (GM-CSF) and interleukin 4. 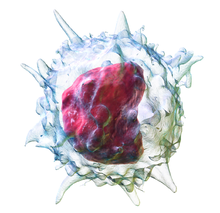 Monocytes and their macrophage and dendritic-cell progeny serve three main functions in the immune system. These are phagocytosis, antigen presentation, and cytokine production. Phagocytosis is the process of uptake of microbes and particles followed by digestion and destruction of this material. Monocytes can perform phagocytosis using intermediary (opsonising) proteins such as antibodies or complement that coat the pathogen, as well as by binding to the microbe directly via pattern-recognition receptors that recognize pathogens. Monocytes are also capable of killing infected host cells via antibody-dependent cell-mediated cytotoxicity. Vacuolization may be present in a cell that has recently phagocytized foreign matter. Many factors produced by other cells can regulate the chemotaxis and other functions of monocytes. These factors include most particularly chemokines such as monocyte chemotactic protein-1 (CCL2) and monocyte chemotactic protein-3 (CCL7); certain arachidonic acid metabolites such as Leukotriene B4 and members of the 5-Hydroxyicosatetraenoic acid and 5-oxo-eicosatetraenoic acid family of OXE1 receptor agonists (e.g., 5-HETE and 5-oxo-ETE); and N-Formylmethionine leucyl-phenylalanine and other N-formylated oligopeptides which are made by bacteria and activate the formyl peptide receptor 1. Microbial fragments that remain after such digestion can serve as antigens. The fragments can be incorporated into MHC molecules and then trafficked to the cell surface of monocytes (and macrophages and dendritic cells). This process is called antigen presentation and it leads to activation of T lymphocytes, which then mount a specific immune response against the antigen. Other microbial products can directly activate monocytes and this leads to production of pro-inflammatory and, with some delay, of anti-inflammatory cytokines. Typical cytokines produced by monocytes are TNF, IL-1, and IL-12. A monocyte count is part of a complete blood count and is expressed either as a percentage of monocytes among all white blood cells or as absolute numbers. Both may be useful but these cells became valid diagnostic tools only when monocyte subsets are determined. A high count of CD14+CD16++ monocytes is found in severe infection (sepsis) In the field of atherosclerosis high numbers of the CD14++CD16+ intermediate monocytes were shown to be predictive of cardiovascular events in at risk populations. Monocytopenia is a form of leukopenia associated with a deficiency of monocytes. A very low count of these cells is found after therapy with immuno-suppressive glucocorticoids. Also, non-classical slan+ monocytes are strongly reduced in patients with Hereditary diffuse leukoencephalopathy with spheroids (HDLS), a neurologic disease associated with mutations in the macrophage colony-stimulating factor receptor gene. ^ Nichols, BA; Bainton, DF; Farquhar, MG (1971). "Differentiation of monocytes. Origin, nature, and fate of their azurophil granules". J. Cell Biol. 50 (2): 498–515. doi:10.1083/jcb.50.2.498. PMC 2108281. PMID 4107019. ^ a b Swirski, FK; Nahrendorf, M; Etzrodt, M; Wildgruber, M; Cortez-Retamozo, V; Panizzi, P; Figueiredo, J-L; Kohler, RH; Chudnovskiy, A; Waterman, P; Aikawa, E; Mempel, TR; Libby, P; Weissleder, R; Pittet, MJ (2009). "Identification of Splenic Reservoir Monocytes and Their Deployment to Inflammatory Sites". Science. 325 (5940): 612–616. doi:10.1126/science.1175202. PMC 2803111. PMID 19644120. ^ Ziegler-Heitbrock, L; et al. (2010). "Nomenclature of monocytes and dendritic cells in blood". Blood. 116 (16): e74–e80. doi:10.1182/blood-2010-02-258558. PMID 20628149. ^ Ziegler-Heitbrock, L (2007). "The CD14+ CD16+ Blood Monocytes: their Role in Infection and Inflammation, Review". Journal of Leukocyte Biology. 81 (3): 584–92. doi:10.1189/jlb.0806510. PMID 17135573. ^ a b Hofer, Thomas P.; et al. (2015). "slan definded subsets of CD16 positive monocytes impact of granulomatous inflammation and M CSF receptor mutation". Blood. 126 (24): 2601–2610. doi:10.1182/blood-2015-06-651331. PMID 26443621. ^ Ghattas; et al. (2013). "Monocytes in Coronary Artery Disease and Atherosclerosis. Where are we now?". Journal of the American College of Cardiology. 62 (17): 1541–1551. doi:10.1016/j.jacc.2013.07.043. PMID 23973684. ^ Said, Elias A.; et al. (2010). "PD-1 Induced IL10 Production by Monocytes Impairs T-cell Activation in a Reversible Fashion". Nature Medicine. 16 (4): 452–9. doi:10.1038/nm.2106. PMC 4229134. PMID 20208540. ^ Carlin, Leo M.; Stamatiades, Efstathios G.; Auffray, Cedric; Hanna, Richard N.; Glover, Leanne; Vizcay-Barrena, Gema; Hedrick, Catherine C.; Cook, H. Terence; Diebold, Sandra; Geissmann, Frederic (2013). "Nr4a1-Dependent Ly6Clow Monocytes Monitor Endothelial Cells and Orchestrate Their Disposal". Cell. 153 (2): 362–375. doi:10.1016/j.cell.2013.03.010. ^ Auffray, Cedric; Fogg, Darin; Garfa, Meriem; Elain, Gaelle; Join-Lambert, Olivier; Kayal, Samer; Sarnacki, Sabine; Cumano, Ana; Lauvau, Gregoire (2007-08-03). "Monitoring of Blood Vessels and Tissues by a Population of Monocytes with Patrolling Behavior". Science. 317 (5838): 666–670. doi:10.1126/science.1142883. ISSN 0036-8075. PMID 17673663. ^ Imhof, Beat A.; Jemelin, Stephane; Ballet, Romain; Vesin, Christian; Schapira, Marco; Karaca, Melis; Emre, Yalin (2016-08-01). "CCN1/CYR61-mediated meticulous patrolling by Ly6Clow monocytes fuels vascular inflammation". Proceedings of the National Academy of Sciences. 113 (33): E4847–E4856. doi:10.1073/pnas.1607710113. ISSN 0027-8424. PMC 4995973. PMID 27482114. Archived from the original on 2016-08-14. ^ Collison, Joanna L.; et al. (2015). "Heterogeneity in the Locomotory Behavior of Human Monocyte Subsets over Human Vascular Endothelium In Vitro". Journal of Immunology. 195 (3): 1162–1170. doi:10.4049/jimmunol.1401806. PMID 26085686. ^ Steve, Paxton; Michelle, Peckham; Adele, Knibbs (28 April 2018). "The Leeds Histology Guide". leeds.ac.uk. Archived from the original on 11 October 2017. Retrieved 28 April 2018. ^ Sallusto F, Cella M, Danieli C, Lanzavecchia A (1995). "Dendritic cells use macropinocytosis and the mannose receptor to concentrate macromolecules in the major histocompatibility complex class II compartment: downregulation by cytokines and bacterial products" (PDF). J. Exp. Med. 182 (2): 389–400. doi:10.1084/jem.182.2.389. PMC 2192110. PMID 7629501. ^ Sozzani, S; Zhou, D; Locati, M; Bernasconi, S; Luini, W; Mantovani, A; O'Flaherty, J. T. (1996). "Stimulating properties of 5-oxo-eicosanoids for human monocytes: Synergism with monocyte chemotactic protein-1 and -3". Journal of Immunology. 157 (10): 4664–71. PMID 8906847. ^ Heidt, Timo; Sager, Hendrik B.; Courties, Gabriel; Dutta, Partha; Iwamoto, Yoshiko; Zaltsman, Alex; von zur Muhlen, Constantin; Bode, Christoph; Fricchione, Gregory L. (July 2014). "Chronic variable stress activates hematopoietic stem cells". Nature Medicine. 20 (7): 754–758. doi:10.1038/nm.3589. ISSN 1078-8956. PMC 4087061. PMID 24952646. ^ Swirski, Filip K.; Libby, Peter; Aikawa, Elena; Alcaide, Pilar; Luscinskas, F. William; Weissleder, Ralph; Pittet, Mikael J. (2007-01-02). "Ly-6Chi monocytes dominate hypercholesterolemia-associated monocytosis and give rise to macrophages in atheromata". Journal of Clinical Investigation. 117 (1): 195–205. doi:10.1172/JCI29950. ISSN 0021-9738. PMC 1716211. PMID 17200719. ^ Fingerle, G; Pforte, A; Passlick, B; Blumenstein, M; Ströbel, M; Ziegler-Heitbrock, HW (November 1993). "The novel subset of CD14+/CD16+ blood monocytes is expanded in sepsis patients". Blood. 82 (10): 3170–6. PMID 7693040. ^ Heine, Gunnar H.; et al. (2008). "CD14++CD16+ monocytes but not total monocyte numbers predict cardiovascular events in dialysis patients". Kidney International. 73 (5): 622–629. doi:10.1038/sj.ki.5002744. PMID 18160960. ^ Rogacev, Kyrill S.; et al. (2012). "CD14++CD16+ monocytes independently predict cardiovascular events: a cohort study of 951 patients referred for elective coronary angiography". J Am Coll Cardiol. 60 (16): 1512–1520. doi:10.1016/j.jacc.2012.07.019. ^ Fingerle-Rowson, G.; Angstwurm, M.; Andreesen, R.; Ziegler-Heitbrock, H.W.L. (1998). "Selective depletion of CD14+ CD16+ monocytes by glucocorticoid therapy". Clin. Exp. Immunol. 112 (3): 501–506. doi:10.1046/j.1365-2249.1998.00617.x. PMC 1904988. PMID 9649222. This page was last edited on 16 February 2019, at 15:13 (UTC).